Sealing Systems Types - GlobeCore. Oil Purification Systems. Sealing Systems Types Free Breathing – Sealing systems have progressed from early designs of “free breathing” tanks, in which an air space on top of the oil is vented to atmosphere through a breather pipe. The pipe typically is screened to keep out insects and rodents and turned down to prevent rain from entering. Breathing is caused by expansion and contraction of the oil as temperature changes. These earlier designs do not use an air dryer, and condensation from moisture forms on inside walls and tank top. Moisture, oxygen, and nitrogen would also dissolve directly into oil from the air. This is not the best design. As mentioned before, a combination of oxygen and moisture accelerates deterioration of cellulose insulation. Moisture also decreases dielectric strength, which destroys insulating quality of the oil and causes sludge to form. 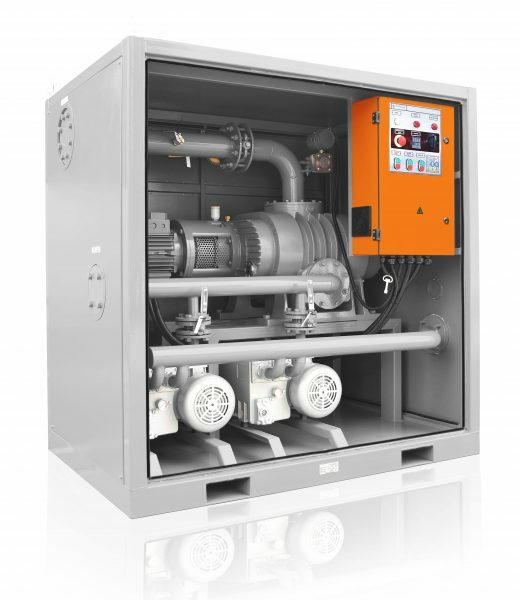 If you have one or more of these earlier design transformers, it is recommended that a desiccant type air dryer be added to the breather pipe. Sealed or Pressurized Breathing – This design is similar to the free breathing type with the addition of a pressure/vacuum bleeder valve. When the transformer was installed, pressurized dry air or nitrogen was placed on top of the oil. The bleeder valve is designed to hold pressure inside to approximately plus or minus 5 psi (figure 35). The same problems with moisture and oxygen occur as previously described. However, these problems are not as severe because “breathing” is limited by the bleeder valve. Air or nitrogen (N2) is exhausted to the outside atmosphere when a positive pressure greater than 5 psi occurs inside the tank. This process does not add moisture and oxygen to the tank. However, when cooling, the oil contracts and, if pressure falls 5 psi below the outside atmosphere, the valve allows outside air into the tank, which pulls in moisture and oxygen. Once each year, check the pressure gauge against the weekly data sheets; if the pressure never varies with seasonal temperature changes, the gauge is defective. Add nitrogen if the pressure falls below 1 psi to keep moisture laden air from being pulled in. Add enough N2 to bring the pressure to between 2 and 4 psi. Pressurized Inert Gas Sealed System – This system keeps space above the oil pressurized with a dry inert gas, normally nitrogen (figure 36). This design prevents air and moisture from coming into contact with insulating oil. Pressure is maintained by a nitrogen gas bottle with the pressure regulated normally between 0.5 and 5 psi. Pressure gauges are provided in the nitrogen cubicle for both high and low pressures (figure 37). 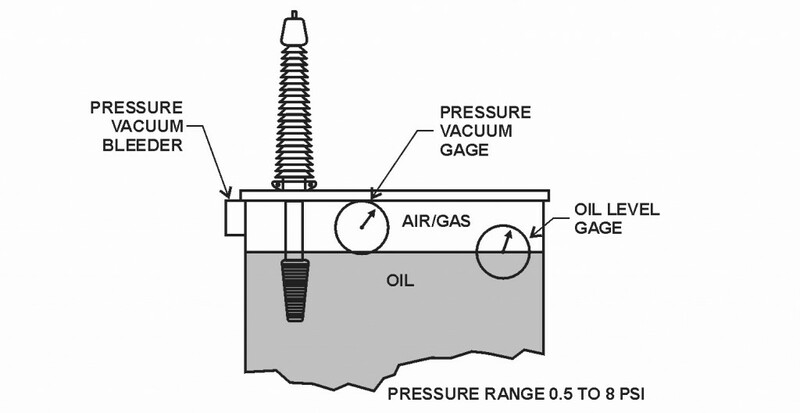 A pressure/vacuum gauge is normally connected to read low pressure gas inside the tank. This gauge may be located on the transformer and normally has highpressure and low-pressure alarm contacts. See section 4.9.2, which follows. If the transformer has a nitrogen blanket, check the pressure gauge for proper pressure. 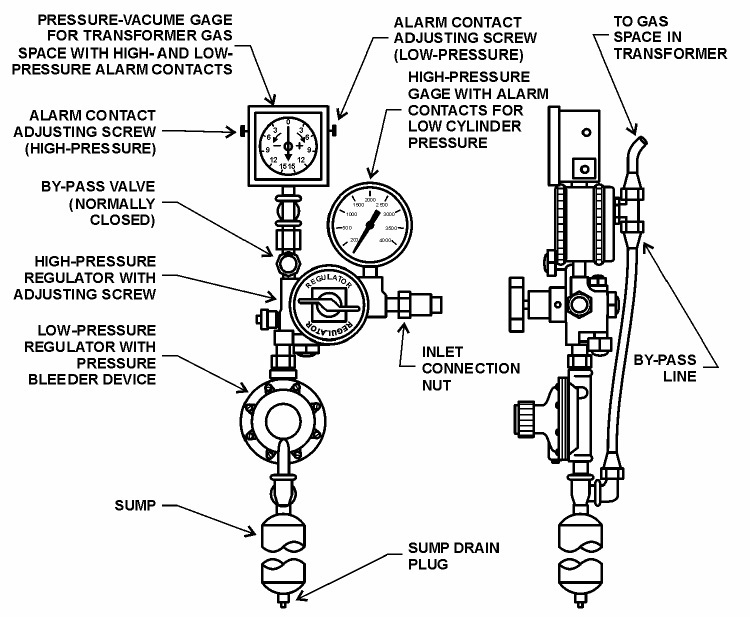 Look at the operators recording of pressures from the pressure gauge. If this does not change, the gauge is probably defective. Check the nitrogen bottle to insure the nitrogen is the proper quality (see Power Equipment Bulletin No. 5 ). Check for any increased usage of nitrogen which indicates a leak. Smaller transformers such as station service or smaller generator-step-up transformers may not have nitrogen bottles attached to replace lost nitrogen. Be especially watchful of the pressure gauge and the operator’s records of pressures with these. The pressure gauge can be defective for years, and no one will notice. The gauge will read nearly the same and will not vary much over winter and summer or night and day. Meanwhile, a nitrogen leak can develop, and all the N2 will be lost. This allows air with oxygen and moisture to enter and deteriorate the oil and insulation. Watch for increased oxygen and moisture in the DGA. An ultrasonic and sonic leak detection instrument (P-2000) is used for locating N2 leaks. Soap bubbles also may be used. When replacing nitrogen cylinders, do not just order a “nitrogen cylinder” from the local welding supplier. Nitrogen for transformers should meet American Society for Testing and Materials (ASTM) D-1933 Type III with -59 °C dew point as specified in IEEE C-57.12.00-1993, paragraph 6.6.3 [29, 2].